Dust off your grills and break out the pool toys summer is right around the corner. Pretty soon your kids will be camped out on the couch remote in hand complaining that there is nothing to do. So do yourself a favor take a weekend and get your backyard ready for summer. There are some inexpensive things you can add to your backyard, no matter what the size that are sure to keep your kids engaged and having fun. Here are a few of my favorite backyard DIY's that you can easily do in a weekend and keep those kids busy and learning all summer long. Use brick pavers to create a road for your little ones favorite trucks and cars, add buildings out of blocks of wood and tunnels using some PVC pipe and a little mulch. Your little ones will let their imaginations loose and play for hours. This is a must have for any backyard, simply mount a large piece of plywood onto your fence, (We used a scrap piece from a recent home improvement project) and paint with black chalkboard paint. If you are impatient like I am you can use the spraypaint. It dries very quickly and goes on very easy. Make sure it is mounted so your little ones can reach, use a small towel hook to hang a galvanized bucket for your chalk. Let your little ones explore with their chalk, let their inner artist go! Crayola makes a wide variety of sidewalk paint including 3D paint, so be on the look out for some fun new products you can let your little ones try out on their chalkboards. Lets face it on those hot summer days your little ones want to splash around, but you need something that won't attract the bugs and is easy to cleanup. I love this project at Lowes you take an inexpensive drip pan and use it as a makeshift water table, easy to just flip over when not in use to keep those pesky mosquitoes away. Your little ones will love splashing around and playing with their water toys. This is our last project we are adding to our backyard summer reno, Home depot sells sheets of plexi glass, a hard piece of lucite that you can attach to your fence. We used some scrap wood to create a small easel edge on our fence. We are also adding metal binder clips which we hot glue to the plexiglass, to hold up artwork and paper for our little ones to get creative. We are adding the plexiglass above it for a couple of reasons. When painting you can simply hose the plexiglass down for easy clean up (we really didn't want a rainbow colored fence). You can also encourage your little ones to explore with a multitude of materials like shaving cream, gels, paint etc. My number one mom tip is to make sure you include a relaxing shady place for mom to hang out so you can supervise those young ones. For me it's a hammock nestled right between two trees. I'm right in the middle of all the creative action! Bubble, bubbles and more bubbles. Kids love to explore with bubbles. So why not encourage their fun. You can purchase an inexpensive kiddie pool ( that could double as a water sensory bin for your little ones) and a hula hoop. 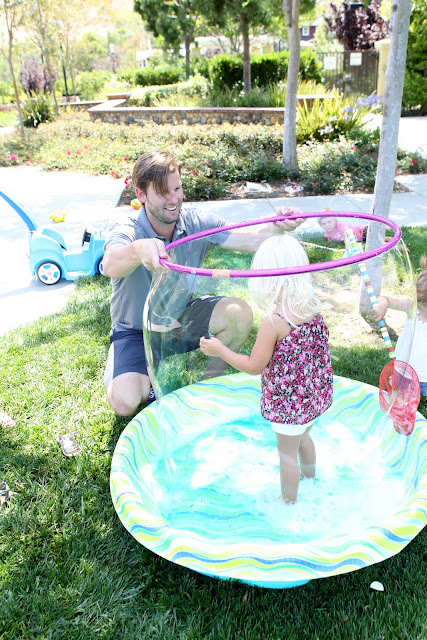 Fill your pool with bubbles ( dawn liquid dish soap and water works best, you can add a few drops of glycerin if you would like stronger bubbles) Have your child stand in the pool and pull the hula hoop over their head and Viola! They are in a bubble! They can also use the hoop to twirl around and make their own large bubbles. I love keeping a large drink canister (plastic of course) on our deck with bubble solution in it. I give my daughter a plastic cup for her bubbles and she refills them when she runs out...she is 4 so they run our quite a bit! Enough can't be said for a good old fashioned water balloon fight. 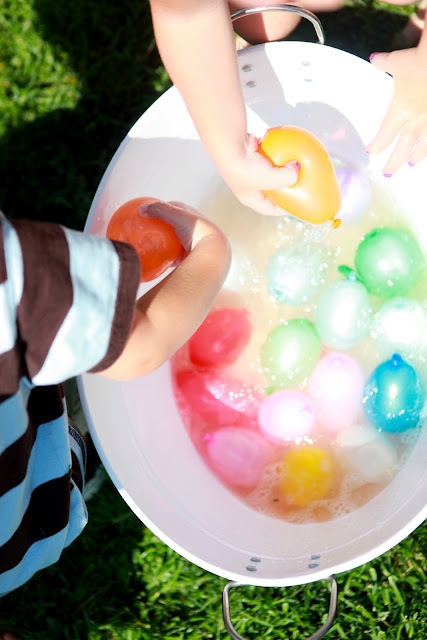 Waterballoons are squishy and slippery and down right fun to pick up. Keeping these on hand for an afternoon splash fight will be sure to bring a giggle to your little ones face. Encourage them to sort them by colors into a variety of buckets, or count them. Or one of my favorite literacy games is to tape flash cards ( letters) to a wall or fence and call out the different letters have your little one hit the correct letter with their water balloon....just remember the younger your child the larger the letters need to be. For your older kids do this with math problems or other concepts that need some practice. So get those kids off the couch and playing outside instead. Have them help you create a backyard oasis that they can enjoy with their friends all summer long. Join us on Pinterest to see some more creative backyard ideas!